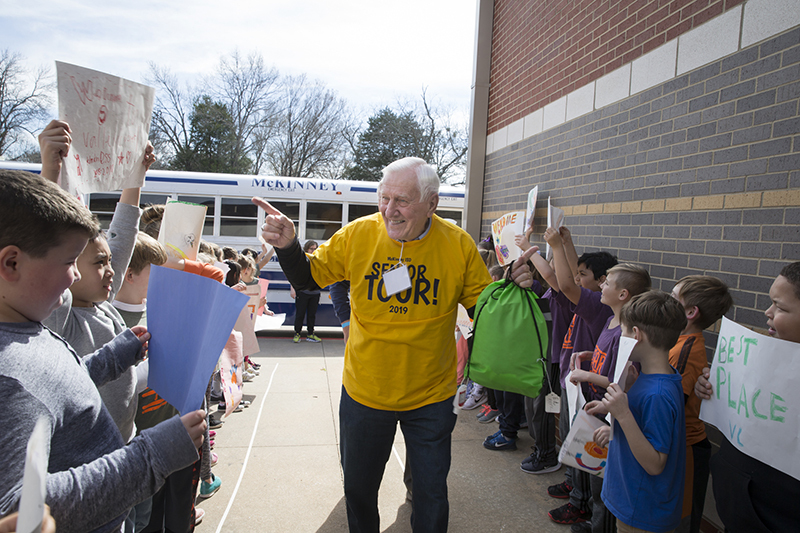 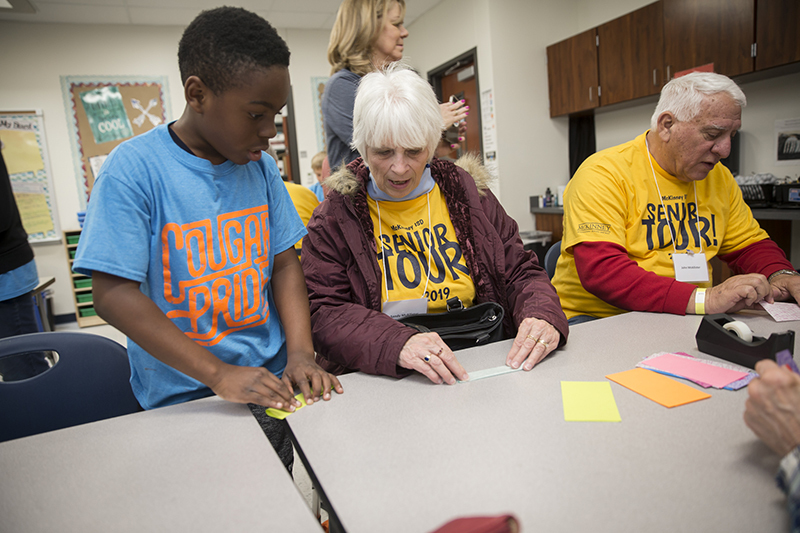 Senior Tour 2019 — Valley Creek Elementary welcomes the Senior Tour! 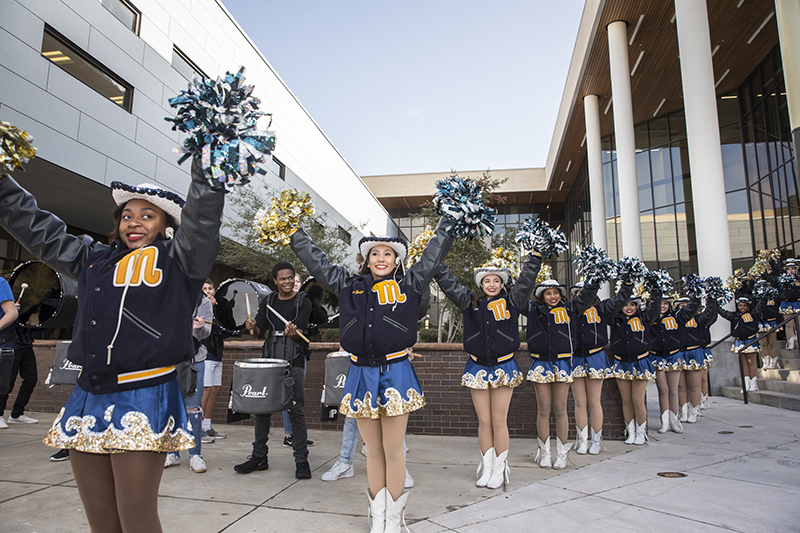 McKinney, Texas – They arrive each year on two blue and white McKinney ISD buses to a reception that invariably includes a multitude of cheering students, handmade signs, high fives and—at some point—a drum line. 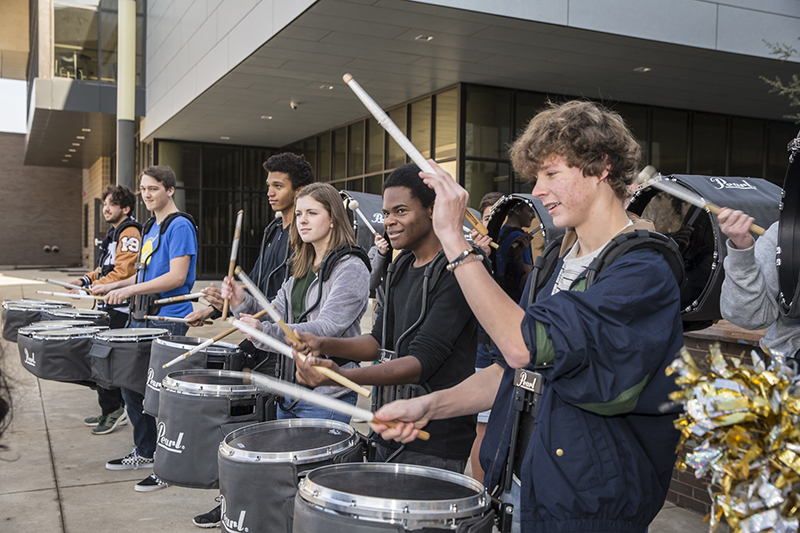 On Feb. 20, it was the MHS Royal Pride drum line who helped kick things off as the eighth annual MISD Senior Adult Tour buses glided to a stop on the drive outside the just-opened McKinney High School Performing Arts Center (PAC) where rank upon rank of pompom-wielding Marquettes and the aforementioned percussionists waited to greet the 70 or so senior adults as they disembarked. 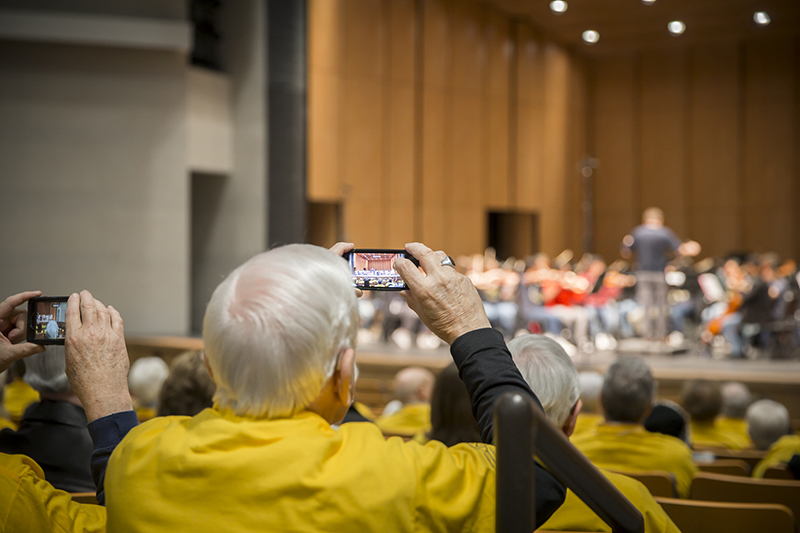 The theme for this year’s tour was the 2016 Bond and some of the completed projects that were funded by it. 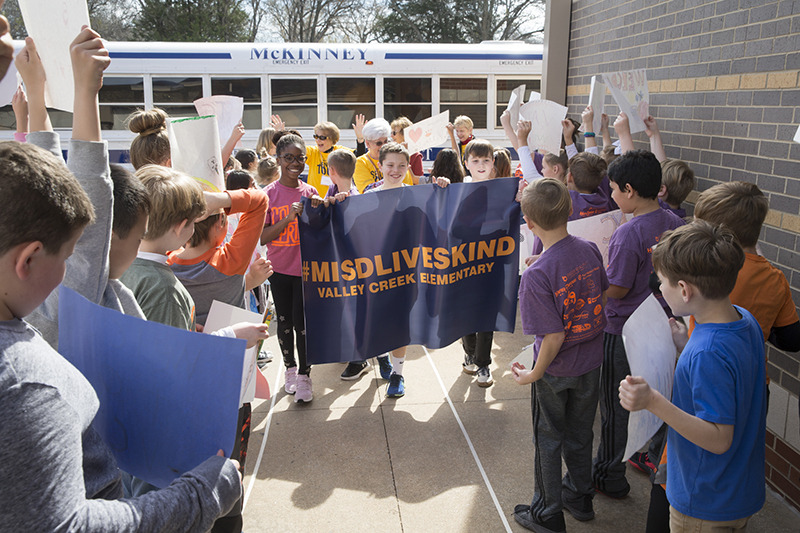 On the itinerary was the stop at MHS, a visit to the new MISD Stadium and Community Event Center and activities with students at Valley Creek Elementary School, which has recently undergone a campus-wide refresh. 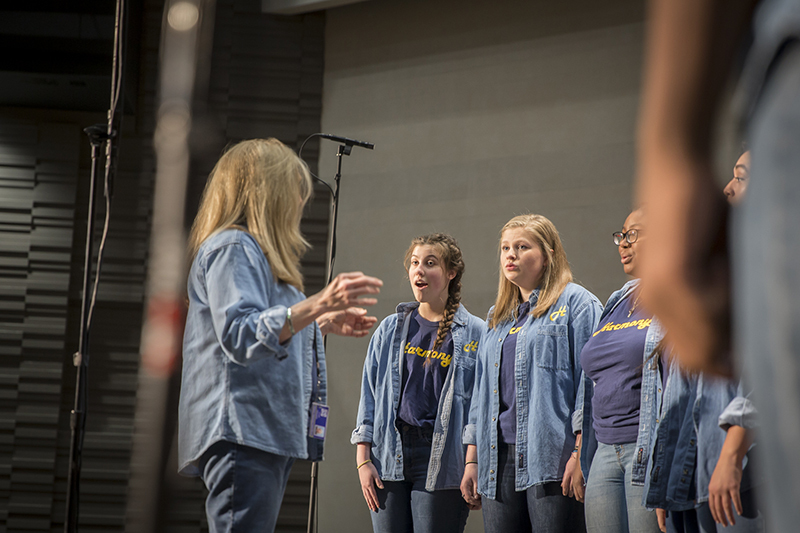 MHS Principal Alan Arbabi was there to welcome the tour guests and lead them into the PAC’s newly-dubbed Sperry Performance Hall where the school’s Harmony choir ensemble was waiting to perform the national anthem. 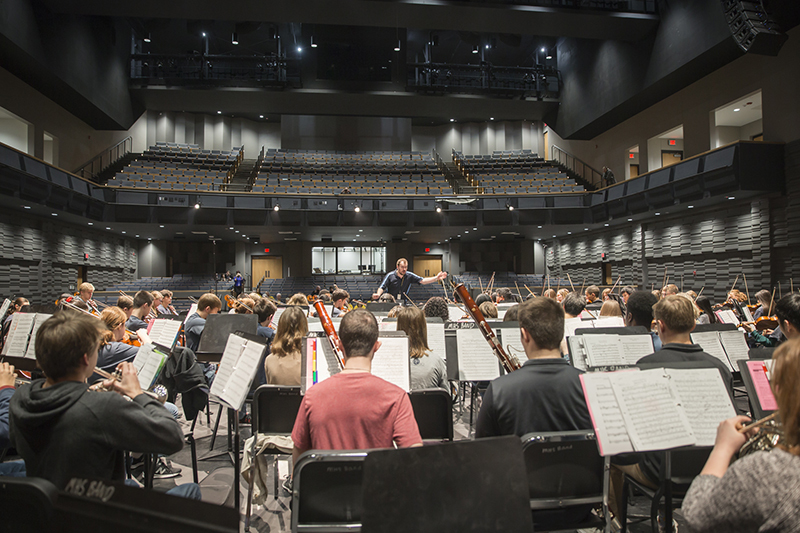 Then, the orchestra took over with a stirring piece that made full use of the auditorium’s world class acoustics. 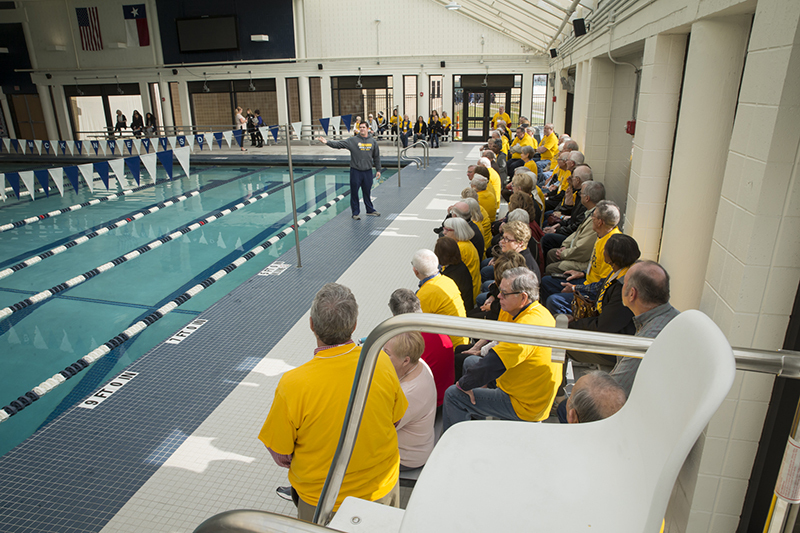 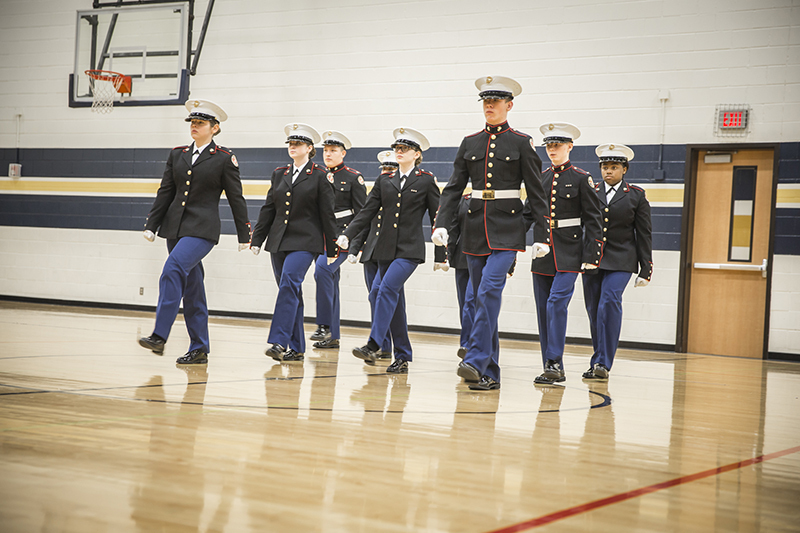 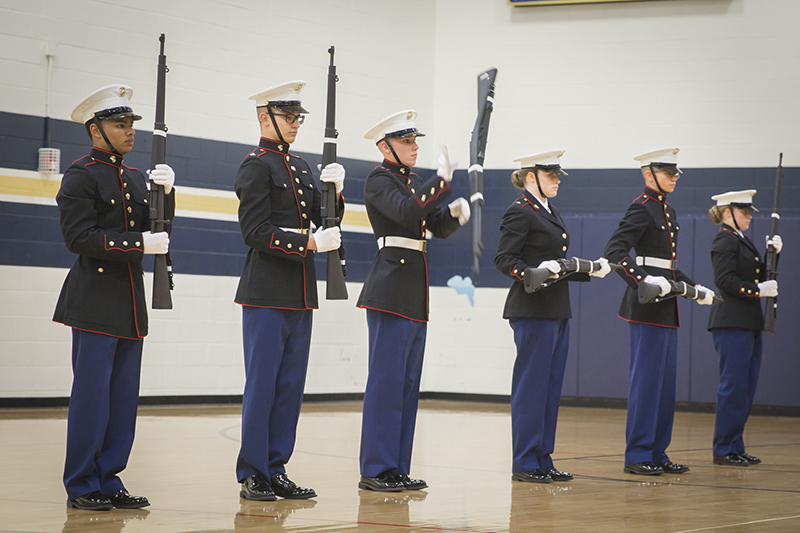 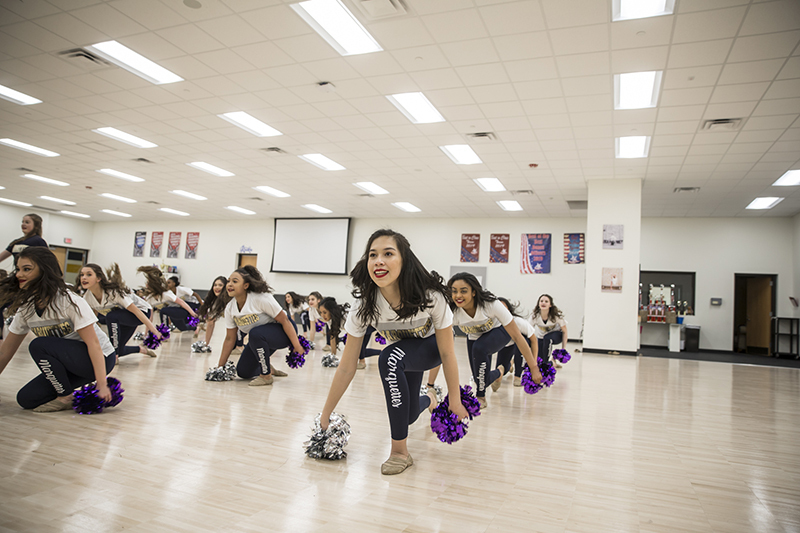 From there, the tour split into groups for a diving demonstration in the recently renovated Sam Serio Natatorium, precision marching and rifle twirling by the always-impressive MHS Marine Corps JROTC cadets and dance numbers by the Marquettes in their newly expanded and revitalized dance studio. 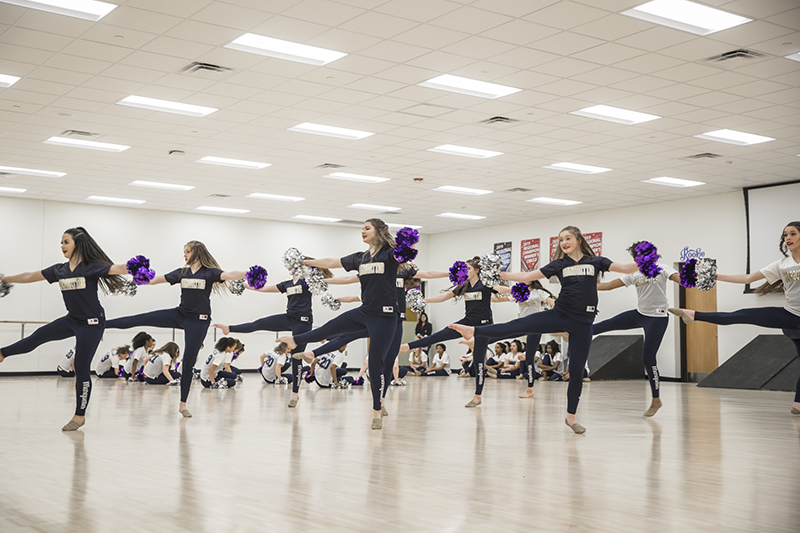 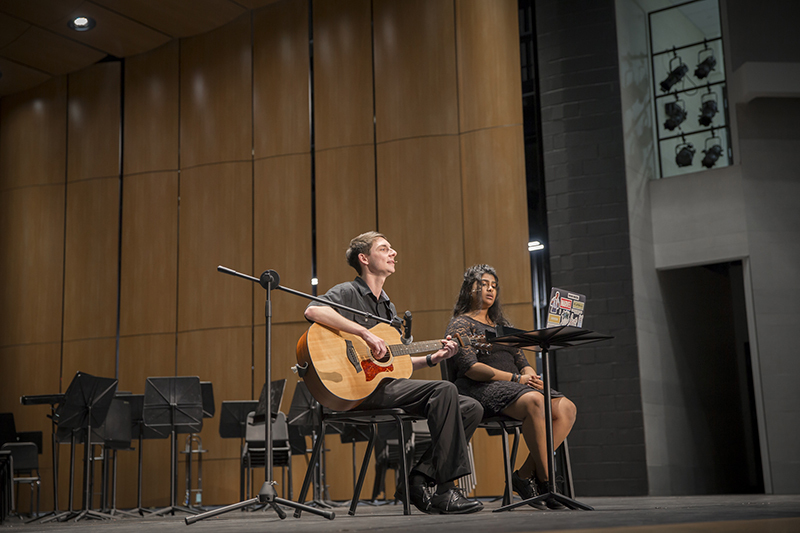 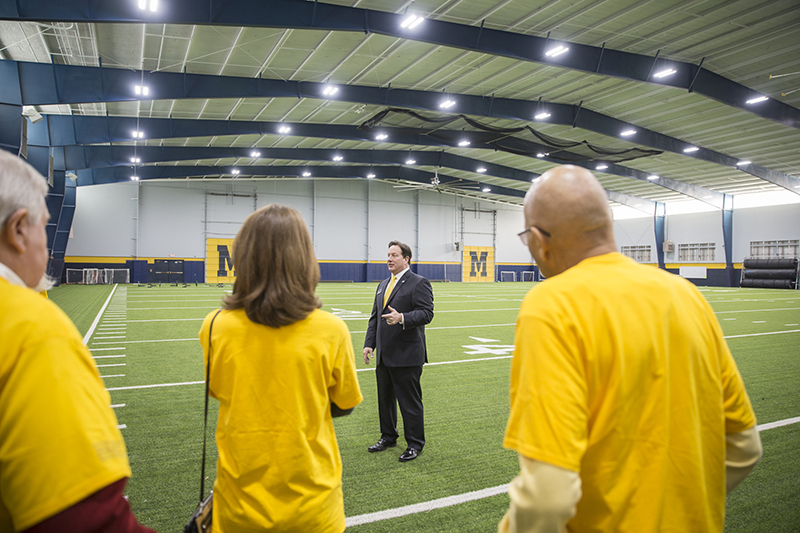 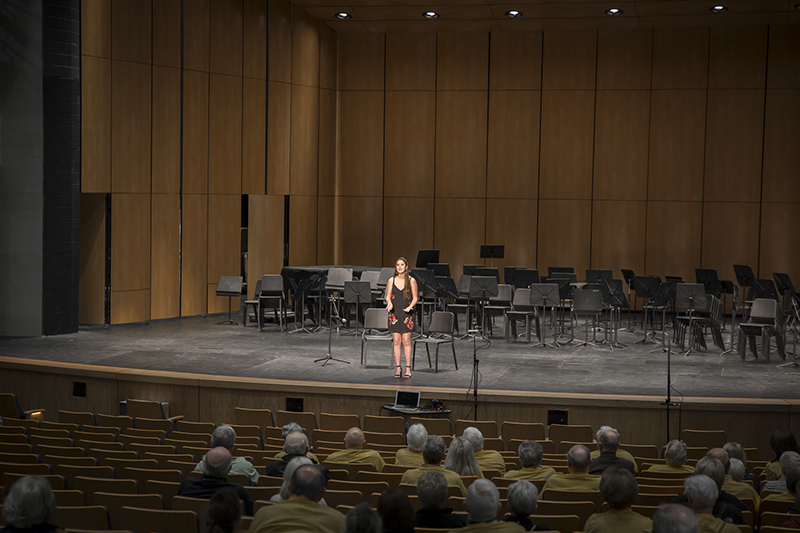 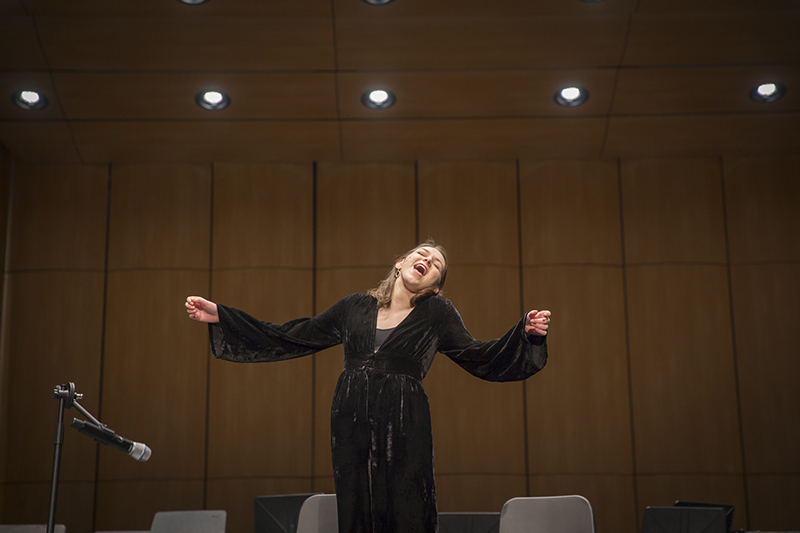 The tour also took in the recently made-over MHS indoor, multi-purpose athletic facility and then returned to the PAC for three, fantastic theatre performances that would conclude their time at the district’s largest high school. 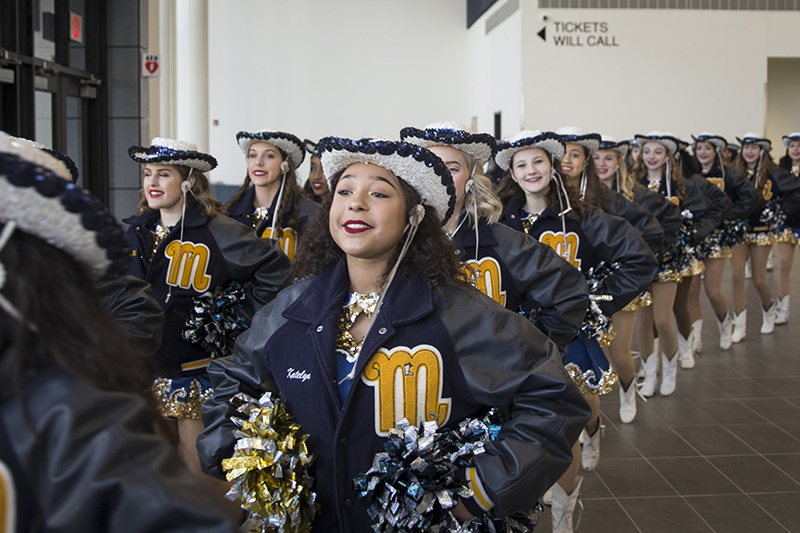 With that, they were back on the buses and zipping off to lunch at the new MISD Stadium and Community Event Center. 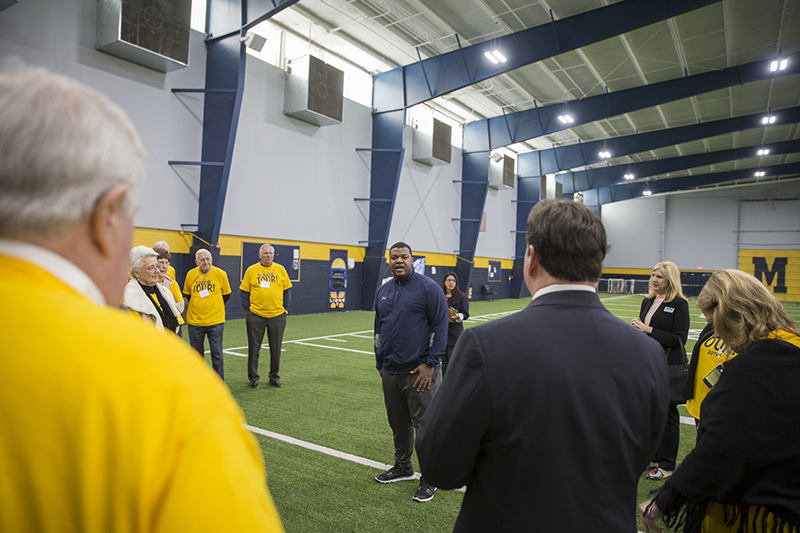 With Assistant Athletic Directors Jennifer Frazier, Laura Keahey and Corey Homer leading the way, groups wound their way through the locker rooms and team facilities and then out onto the field to take in the breathtaking view from a player’s perspective. 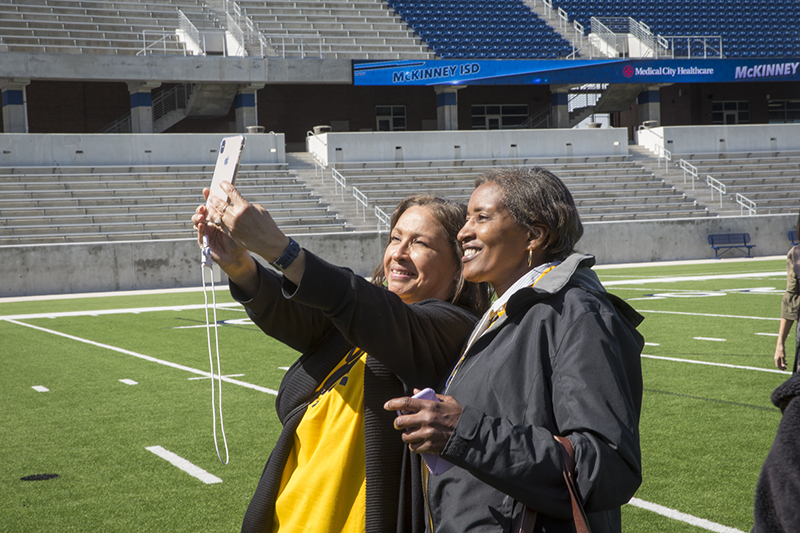 Then, they made their way to the highest point in the stadium to check out the view from the state of the art press box. 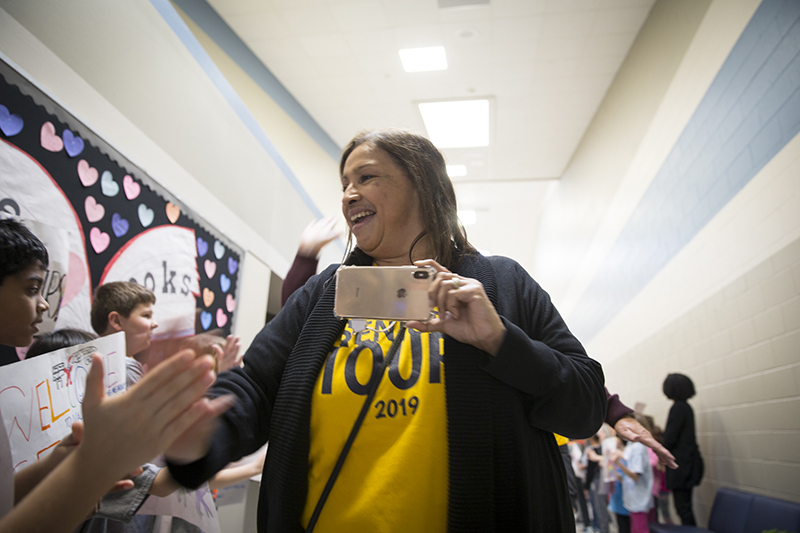 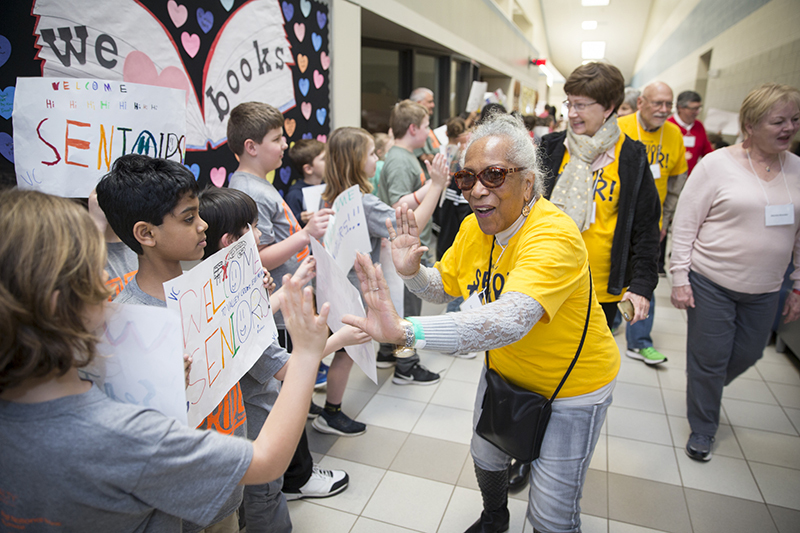 The day’s final stop was at Valley Creek Elementary, where they were met by a tidal wave of happy vibes that swept them along through the school’s main corridor filled with sign-waving, cheering kids. 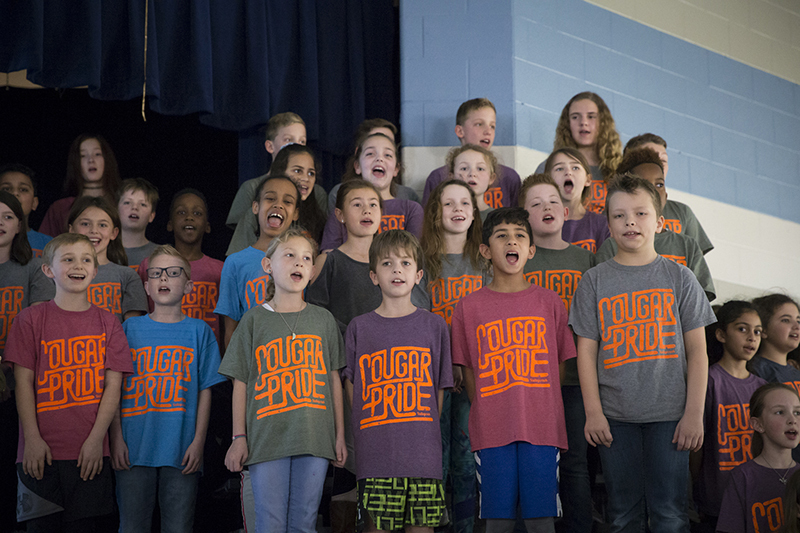 They ended up in the cafeteria where they were treated to a choir performance, and then they were whisked off to classrooms all over the school to explore the world of Valley Creek. 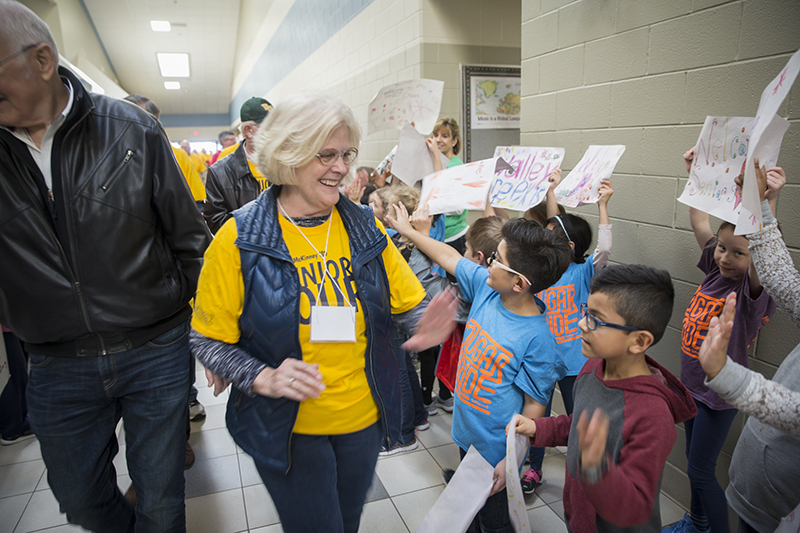 “We are so thankful to be able to share our school today with the senior adults of McKinney,” said Principal Megan Richards. 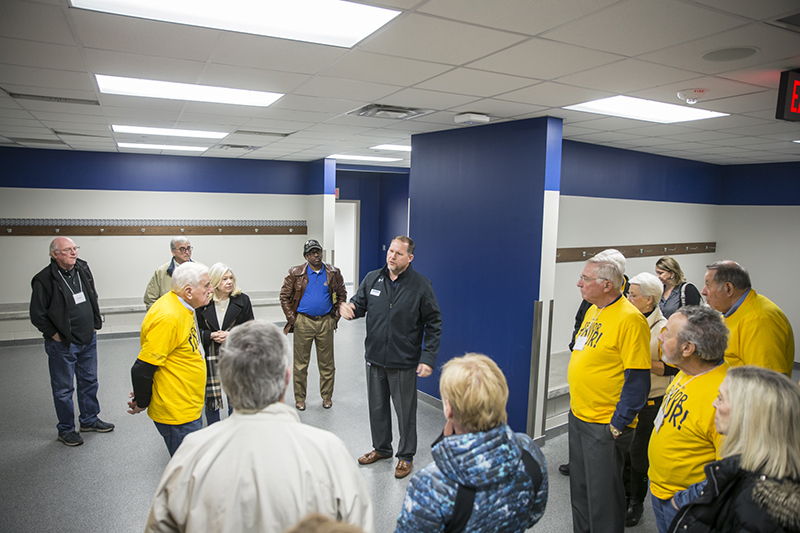 “We benefited from the recent bond election, and we were able to take the senior adults all around our campus to spend time with our students and see all of our updates and the refreshed, new parts of the school. 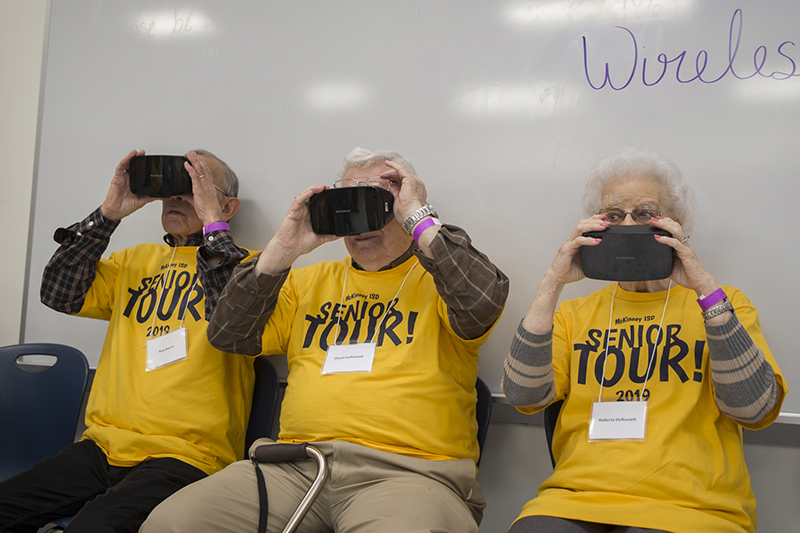 To that end, the Valley Creek students and their guests explored space and the deep sea through virtual reality goggles and Google Expeditions. 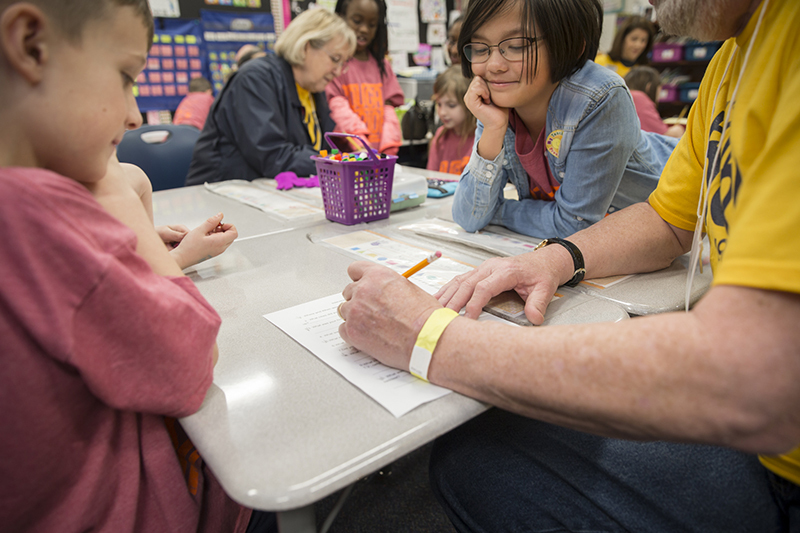 In art class, they tried their hand at origami. 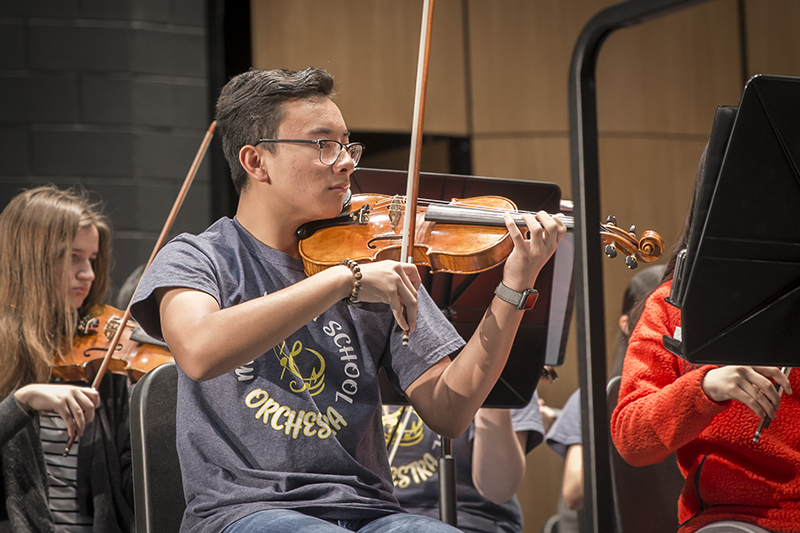 “Just try your best,” one student advised when the folding got complicated. 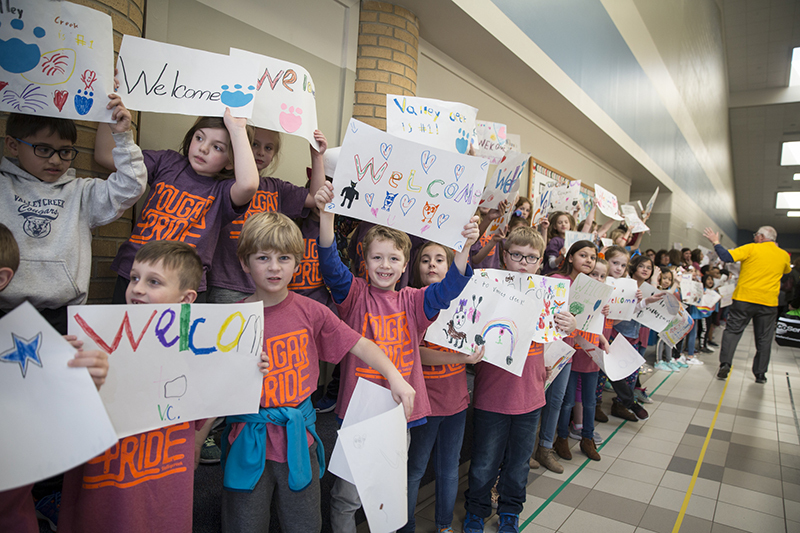 They took part in student interviews and visited the learning commons and the choir room and kindergarten classrooms to see how the school’s renovation and technology upgrades where being deployed day to day to enhance student learning. 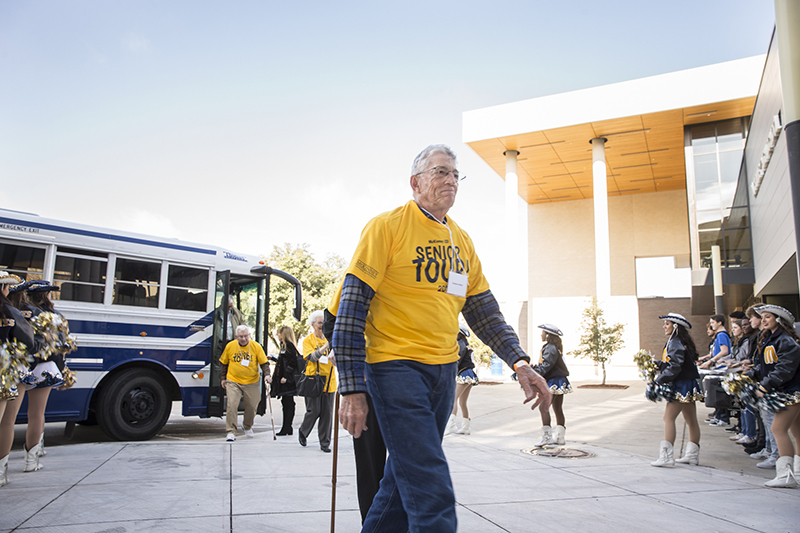 Before they knew it, the tour had come to its conclusion, and it was time to climb back aboard the buses.